JUDGE JUDY: Tosses Reality Drama Out of Court! During a recent taping of reality court show “Judge Judy” a case was driven with reality drama, and Judge Judith Sheindlin wasn’t having it. A Plantiff and Defendant brought their case in front of Judge Sheindlin this week where the show films in Hollywood at Sunset Bronson Studios. Their case was so quick, we can’t even report what it was about. Because as soon as the former couple starting to argue about their past relationship and not aimlessly skirting the details of the case, Judge Sheindlin dismissed them stating to the effect of ‘we don’t encourage reality television personal drama on this show, and if you want to make spectacles of yourselves, “get on another program!” as she stepped off of her bench, not even hearing their case. “Another program”…she may have been talking about a number of other feuding court shows that deal with more personal drama than law such as: “Judge Joe Brown”, “Divorce Court”, “Judge Alex”, or daytime talk show “Jerry Springer” have all been found guilty of this reality show practice all in the vain of “good television”. The couple left discouraged and still heated. 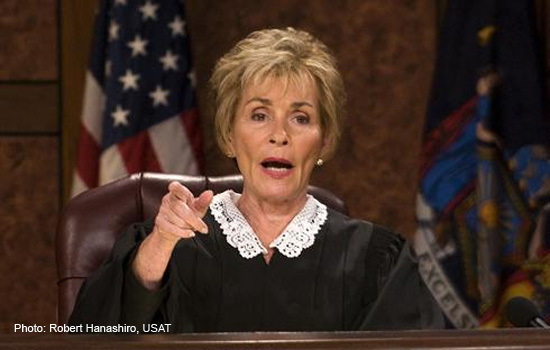 Judge Sheindlin made it clear that her show does not indulge in promoting reality show drama for the sacrifice of getting to the core of the court cases and doesn’t use the forum of the legal system to do it, proving that she is still the most legit judge on reality court television. Just the facts please! We expected that the litigants would return later that day, but the did not. Perhaps on a future show.